One of the most insightful long-term visions for a stable climate that I’ve ever read. Great post, Peter! You are a mountain mover!!! We can restore the climate of the 1980s by 2070. It won’t require a miracle or big sacrifices, just the will and policies to do it. Top climate scientists confirm this is possible. Restoring the climate requires that we switch to carbon-free energy by 2030-2050, as described by Stanford’s Prof. Mark Z. Jacobson, and let the ocean continue absorbing the carbon dioxide we’ve emitted. This entry was posted in TBD on March 17, 2014 by jarrodmrussell. If you live in San Diego like I do, this headline surprises you. 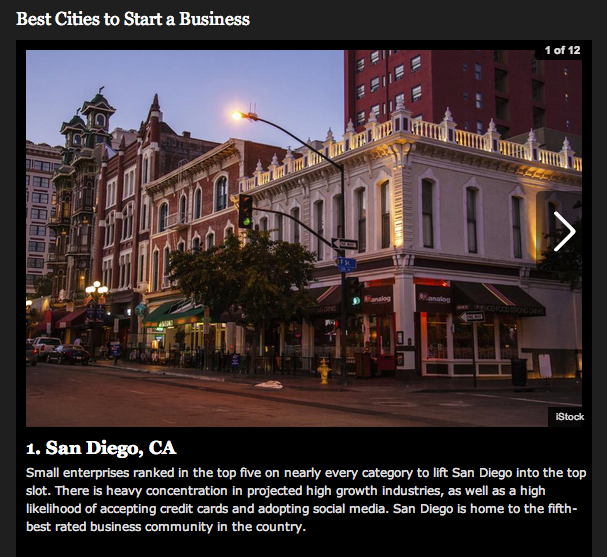 San Diego, #1 startup location, really? Was there a mistake? If you live in Silicon Valley, you are probably saying the same thing as you wisp across a Fortune-500 tech campus on a Segway. Put your iPads down, folks, San Diego is trying to rid itself of the “sunshine discount” by creating a vibrant quality-of-life business community for boomers and millennials alike. Small businesses as a percentage of total businesses. Percentage of small businesses that accept credit cards. Percentage of small businesses in high growth industries. Percentage of small businesses with Facebook pages and websites. Percentage of businesses with online reviews. As a freelance consultant with more clients in Latin America than in San Diego, I often gripe about the need to have a more robust community here locally. I remember past conversations with friends and mentors where, after a trip to SXSW, I’d say, “Have you been to Austin lately? Now they are doing it right!”; or “Seattle is the place to be right now as a young entrepreneur.” Now, after reading this article, I am saying to myself, “There is a lot of good happening right here at home! Maybe I should check the surf a bit less and pay closer attention to the temperature of the SD business community.” Since my background is in international affairs, sustainable development, and corporate social responsibility there is a strong professional pull to Sacramento, San Francisco, DC, New York, and (in my case) Rio de Janeiro. My goal is still to make San Diego my home base — which makes mom and dad happy up in Oceanside. For any young professional in San Diego, I believe patience and creativity on the professional front will provide big returns in the long run… and the timing is right. Despite our Port, our proximity to the border with Mexico, our industries (defense, bio, tourism, beer making, renewables, etc), and our weather; I’d still say San Diego punches below its entrepreneurial weight. Yet, there is a real sense of a turning point. I remember when Nathan Fletcher was running for mayor after Hugs-Too-Much Filner got canned. Nathan proposed San Diego change its name to hint at something more innovative than America’s Finest City. “FINE” sounds like “ok”; but truth be told, we are doing exceptionally well. America’s exceptional city is creating a gravitos thanks to organizations like CONNECT, CleanTECH San Diego, The San Diego Venture Group, CommNexus, UC San Diego, SDSU, and the list goes on. We’ve also got a pair of Fortune-500 HQs — Qualcomm and Sempra — as well as a benevolent global NGO called Project Concern International and a wonderful, community-focused institution called The San Diego Foundation. My favorite international environmental organization, Citizens Climate Lobby, was founded and is headquartered here in Coronado Island just outside downtown San Diego. I volunteer for them about as much as I receive paid work for my clients, seriously. This entry was posted in TBD and tagged beer, bio, citizens climate lobby, CleanTECH SD, commnexus, Connect, defense, entrepreneurship, forbes, nathan fletcher, project concern international, qualcomm, renewable energy, renewables, san diego, san diego foundation, SDSU, The Best Places To Launch A Startup In 2014, the san diego venture group, uc san diego on March 17, 2014 by jarrodmrussell. Eliot Peper just released Uncommon Stock on Amazon. In the process, he has started a whole new genre, the startup thriller. I am not surprised by Eliot’s creativity—nor will I be surprised by his literary success—and here’s why. Eliot and I went to graduate school together. There is not enough storage space on this blog to enumerate the mile-long scroll of ideas he and I have dreamt up together over the years. Although it is fun to dream with friends, it is all the more rewarding to see them actually create that which they envision. My motto is good beer for big ideas and strong coffee for getting them done. One of my fondest memories is when Eliot, Andrea Castillo (his fiancé), Lila Petersen, and I worked on a solar panel electrification project for a small fishing village in Baja California, Mexico. We dreamt up the project, got funding, and now those panels—along with their LED lights and small batteries—continue shine light for rural families to read comfortably at night years later. With Eliot’s most recent endeavor as an indie writer, I am witnessing what will surely become another fond memory. 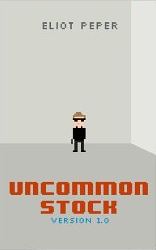 Through well-crafted prose and razor-sharp whit, Eliot shines a literary spotlight at the fast-paced startup industry in this debut novel, Uncommon Stock. Many distinguished entrepreneurs, much more savvy than myself in the startup space, have already showered the book with accolades. In his book review, Brad Feld, managing director at Foundry Group and founder at Techstars says, “Insanely cool… a gripping roller coaster ride through the world of tech entrepreneurship. Tears you out of your seat and into a brand new genre, the startup thriller. Watch out, it will hijack your free time through to the last word. More, please?” I was delighted to find out that the content of Uncommon Stock extends beyond the book. 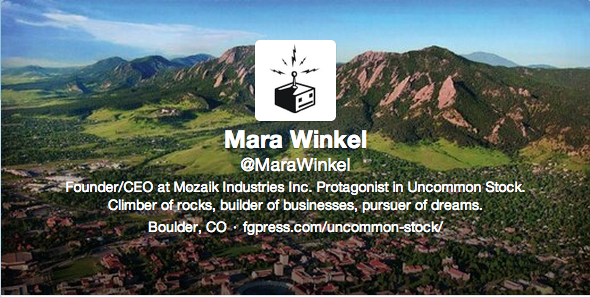 Readers are actually able interact with the story’s protagonist, Mara Winkel, on Twitter. Eliot and I recently had a chance to chat. Below is the Q&A that resulted. If you are interested in even more insights directly from Eliot, I encourage you to take a look at this FAQ. Jarrod: What is the creative process of writing like for you – beer, scotch, sleep, tea, repeat? Do you write in short bursts in a coffee shop or long, focused sessions surrounded by dark mahogany desks? Eliot: I usually try to write in one to three hour sessions. If I write for less than an hour at a time, I don’t usually make much progress. Just like with running, it helps to warm up. If I write for more than three hours in one sitting, my brain just sort of shuts down and I stop being productive. Often I’ll have a cappuccino or cup of tea at hand. Sometimes some 70% cacao chocolate (go dark or go home). J: Did you write Uncommon Stock in a linear fashion or did you hop around the plot? I.e. when you wrote the first word, did you more of less know what the last word would be? E: I had no friggin’ clue what the last word was going to be when I started. People often classify writers as “plotters or pantsers.” I’m firmly in the latter category. I had an idea for a scene and a couple of characters that intrigued me and I started typing. Then I followed where the characters decided to take the story. It resulted in a lot of heavier editing after the first draft was complete and there were a lot of headaches along the way but it was a fun process. On my next book I might experiment with other options just to see what it feels like. J: Where, physically, did you write this book? E: Coffee shops, living rooms, Sri Lankan beaches, Ethiopian hostels, Nepalese cafes, my desk. Many writers have one spot where they get into their zone. I dabble. J: Which character did you identify with most in the novel? E: I think there’s a little bit of the writer in every character they write. It’s almost like you’re doing a personality transplant and mixing up the pot other elements. The important thing is that you think of characters as actually people. They’re your friends, not your toys. If you think of them as fictional, they start to feel fictional to the reader and break up the suspense with disbelief. J: Who is your Mara in real life? E: I’m blessed to have many strong women in my life. Mara is inspired by all of them. A reviewer last week described her as the “Lara Croft of startups” and I think that’s pretty awesome. J: After finishing the publishing roller-coaster process culminating in your first book, how has your perspective of the industry changed? E: I’ve learned a lot along the way. Uncommon Stock is the lead title for a brand new publishing company, FG Press. It’s a book about a tech startup in Boulder being published by a tech startup in Boulder! They’re doing it really differently and I’m thrilled to be on board for the ride. Basically, they offer a 50/50 royalty split to writers and are trying to shape a saner world for readers too. That’s it, folks! Thanks for stopping by. I’ll sign off with a video from one of Eliot’s favorite songs, Mackelmore and Ryan Lewis’ “10,000 Hours”. It seemed fitting because Eliot is certainly on his way to 10,000 hours of writing. Good luck, my friend, on this new adventure! 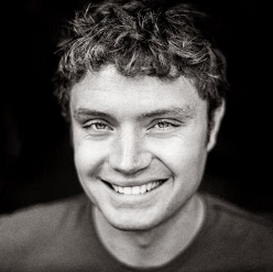 This entry was posted in TBD and tagged boulder, brad feld, eliot peper, IR/PS, macklemore, startup, techstars, uc san diego, UCSD, uncommon stock on March 13, 2014 by jarrodmrussell. This entry was posted in TBD on September 10, 2011 by ucsdirps.